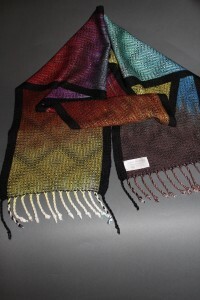 I love using my handwoven items every day. There is something satisfying about picking up an item I have made and putting it to good use. 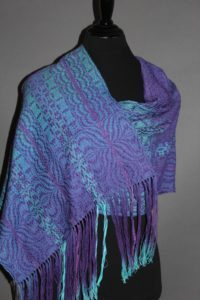 Each piece I weave is designed with the end use in mind so having something functional when I finish weaving is important. 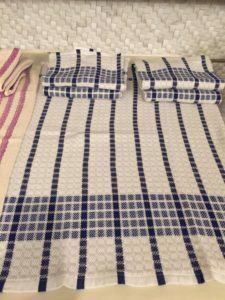 Unfortunately, when I give or sell towels to people, the towels are more likely to become small table runners, or to sit in a drawer. 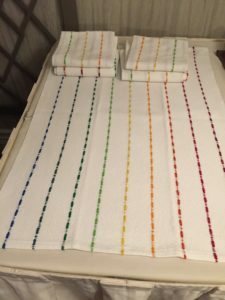 People tell me that the towels are just too pretty to use on dishes or hands. 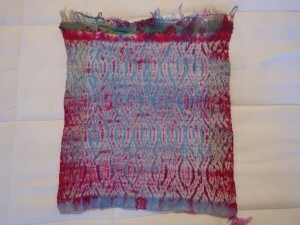 When I give a towel to another weaver, though, they are likely to use that sucker. This year at Convergence 2018 in Reno, I participated in the towel exchange. We were given guidelines for final dimensions and type of fibers to use. 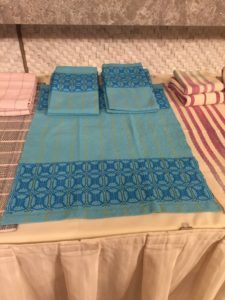 Each participant wove 5 towels and brought the towels with them. 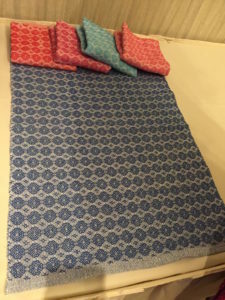 In return, we went home with 5 new handwoven towels, each from a different weaver. Along with the towels, people shared instructions for how to reproduce their towel. 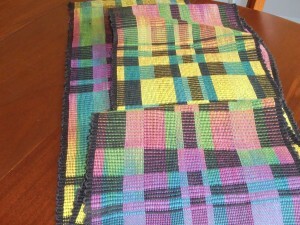 What fun it was to weave and share towels. Over 50 people participated in the popular event. 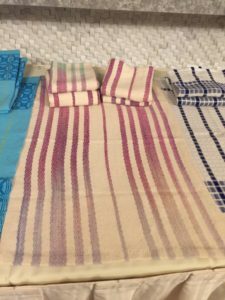 I was excited by the towels I received and I got some good ideas for weaving more towels. There are plans for doing a similar exchange in two years at the next Convergence and I hope to join in again. 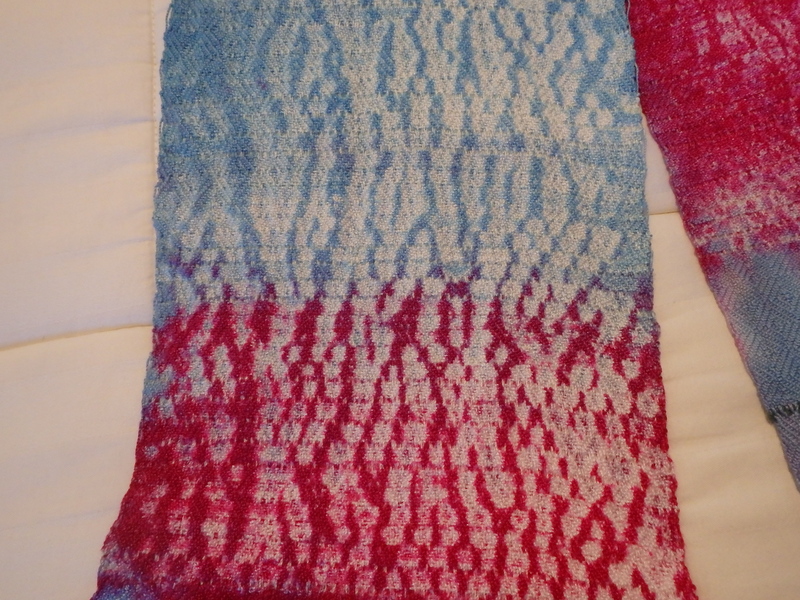 The towels I wove included overshot borders. I loved the earth tones in these. A little color can go a long way. I love all that is going on in these towels. 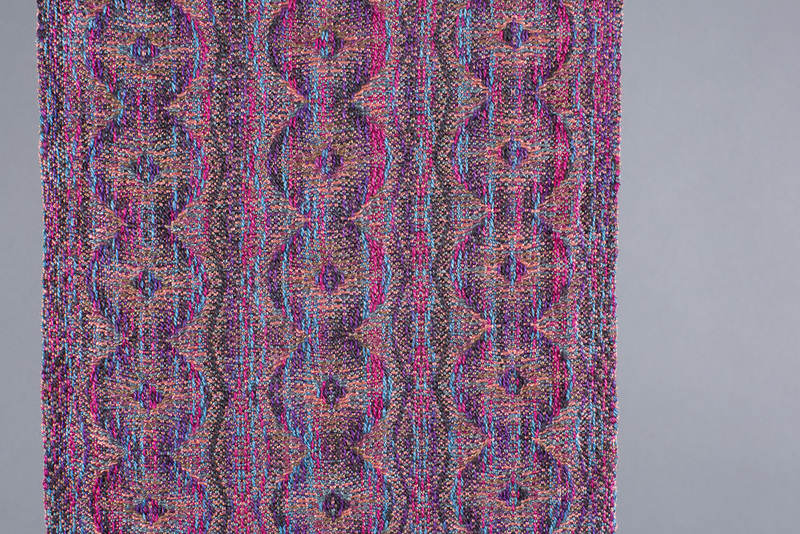 These feature beautiful space dyed warp stripes. These color changes are lovely. 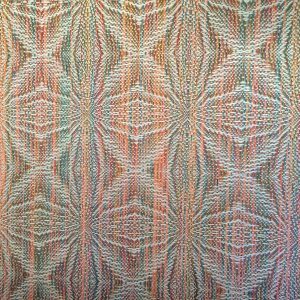 This July I will be teaching a workshop in Reno, NV as part of Handweavers Guild of America’s Convergence 2018. The workshop explores the possibilities of a weave structure known as overshot, one of my favorite types of weaving. In preparation, I went back through old photos to find examples of my own overshot exploration. As I reviewed my previous overshot pieces I reflected on why I find this weave so satisfying, and a few observations came to mind. Overshot has some strong pattern lines. As you weave it you see the pattern unfold one shuttle-throw at a time. Lines build upon each other to develop curves. 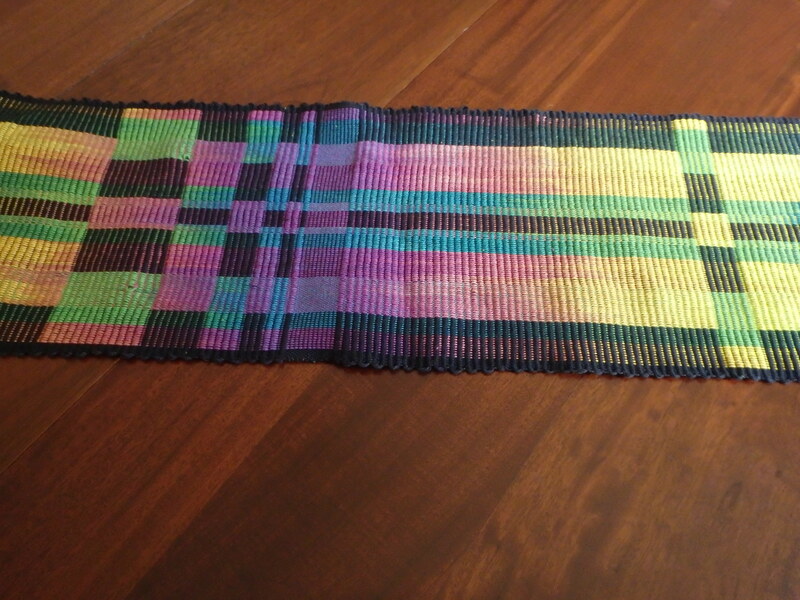 This table runner was woven in the traditional Rattlesnake Trail pattern. Overshot also has strong ties to history. 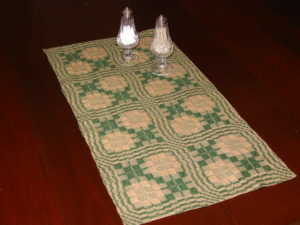 Many coverlets seen in early American reproductions are made using overshot patterns. 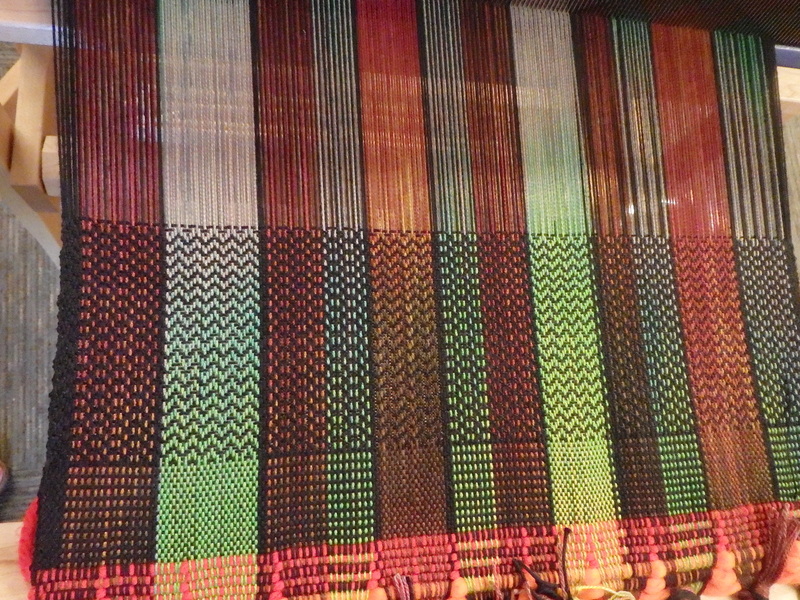 Weaving overshot ties me to the many weavers who came before me. 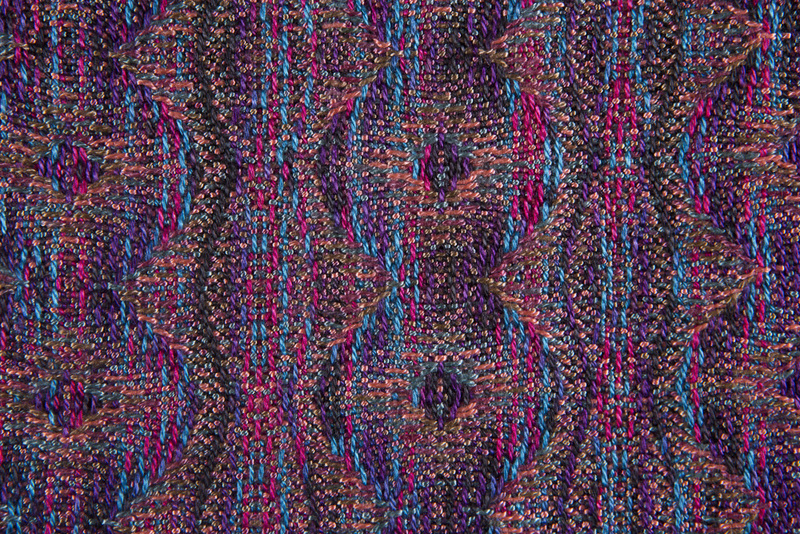 Detail of a traditional Mary Anne Ostrander overshot runner. Overshot also allows for a lot of color interaction. 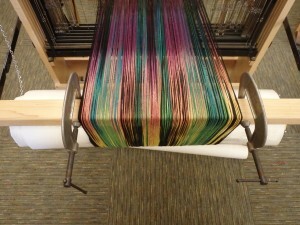 Sometimes the weft makes long floats over the warp so you see areas of pattern weft color. 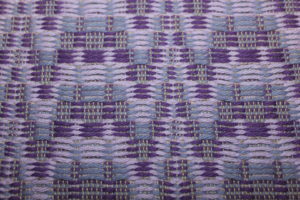 Sometimes you see more of the background plain weave where thin warp and thin plain weave weft intersect and form blocks. 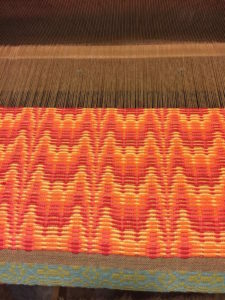 In other areas you see the pattern weft going in between warp and the two elements blend to get a completely different color. Overshot treadled in a style called “on opposites”. In the workshop I teach we try out different ways of combining pattern and color to get cloth that doesn’t look like traditional overshot. Italian style treadling of an overshot threading. Flame treadling of an overshot threading. If I had to choose only one type of weave to concentrate on for the rest of my weaving career, it could easily be overshot. I could play with it for a long time without getting bored. It has been a busy summer of traveling, but the past few weeks have seen me settled down in the studio and getting ready for the fall Charlottesville Artisans Studio Tour. A pile of scarves waits on my dining room table ready to be washed. Another pile sits on the living room couch waiting for fringe to be twisted. More scarves are on the loom in the studio. I have been throwing the shuttle daily, watching the thread unwind from the shuttle and dreaming up more designs. I wish my feet and hands could keep up with the ideas that stream into my head. There are always a bunch of “what ifs”. What if I tried these colors together? 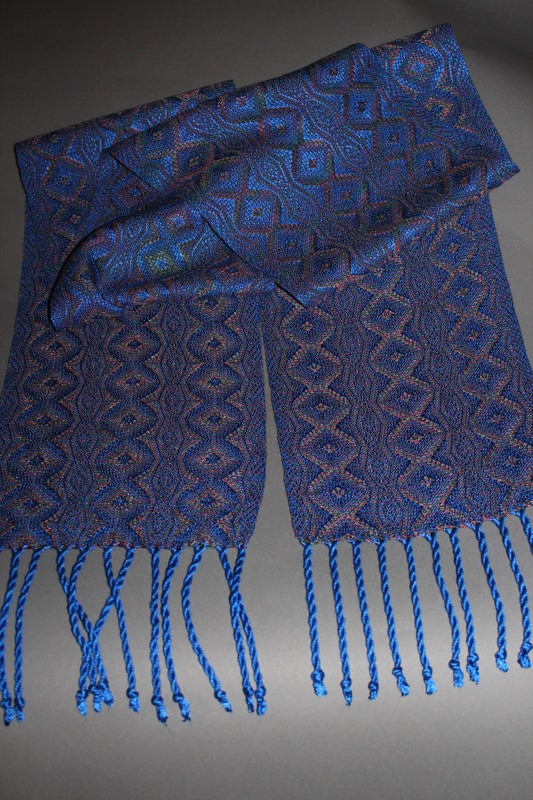 What if I tried treadling this pattern? What if I added stripes? That’s the joy of weaving–there never seems to be a lack of new ideas to try. I will post pictures of the finished scarves soon, but in the meantime, I can’t resist taking pictures while they’re still on the loom. Here are a few offerings. This fall has been plenty busy. After a summer of travel, I’m finding great inspiration around home. The soft colors of sunrise or the brilliant leaves against a spectacular sunset are hard to capture in fabric but I’m giving it my best. I have found new yarn to help me and that’s a good thing since the 22nd annual Artisans Studio Tour is just around the corner. 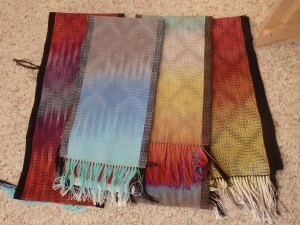 Below are pictured some of this year’s scarves. To view the complete collection, go to my current work page. I will be in Mud Dauber Pottery again this year from 10-5 on November 12th and 13th. I hope to see you there. 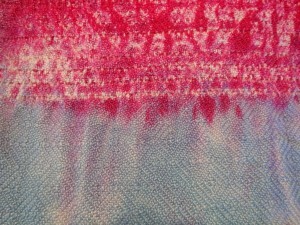 One of the new scarves with hand-dyed warp. 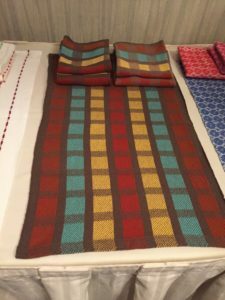 This weekend is the big weekend for a talented group of artisan craftsmen who will be showing and selling their work in and around Charlottesville, Virginia. I’m fortunate to be part of this group, Artisans Studio Tour. I will be showing my work at Mud Dauber Pottery. 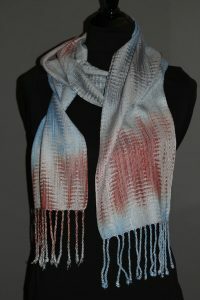 This year I’ll have a new style of scarves, using hand-dyed thread from Kathrin Weber of Blazing Shuttles. 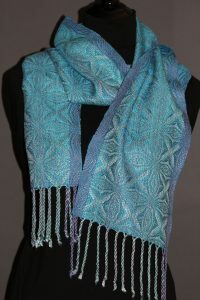 Her color work is beautiful and I love the feel of the material she uses. 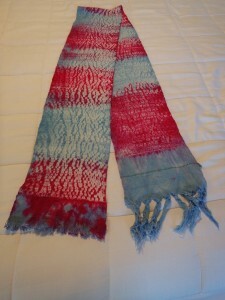 I’ll still have some of my traditional scarves, too. Our central Virginia fall colors are still gorgeous so there will be beauty both inside and outside the local studios. This is my big chance each year to meet customers face-to-face and talk about my process and what inspires me. I look forward to it each year and this year is no different. We’ll talk over food and cups of hot cider. I’ll have my demo loom there and people can throw the shuttle a few times if they want. We have all been working hard to make the tour a success. Here’s hoping we have plenty of visitors and get to reconnect with people who love fine craft. Over a year ago I took a workshop with Su Butler called “You Did That on Four Shafts?”. Su’s an inspiring teacher with a wealth of experience. The workshop covered surface design and some dying techniques. One technique she taught us was woven shibori. We used a natural colored thin thread to weave plain cloth (either plain weave or twill for you weavers). 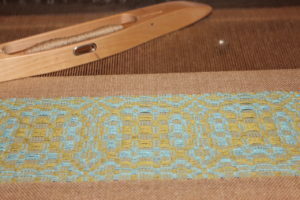 Every few weft shots, we lifted the shafts in a different pattern and wove in a sturdy, thicker thread (8/4 cotton warp). When we wove in the thick threads we left 3″ tails hanging out on each side of the fabric. 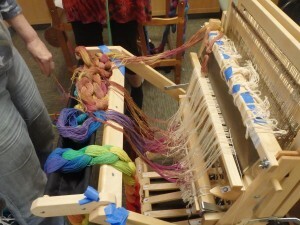 After removing the fabric from the loom, we pulled on the tails of the thick thread to gather the fabric. This made it all puckery across the width of the fabric. 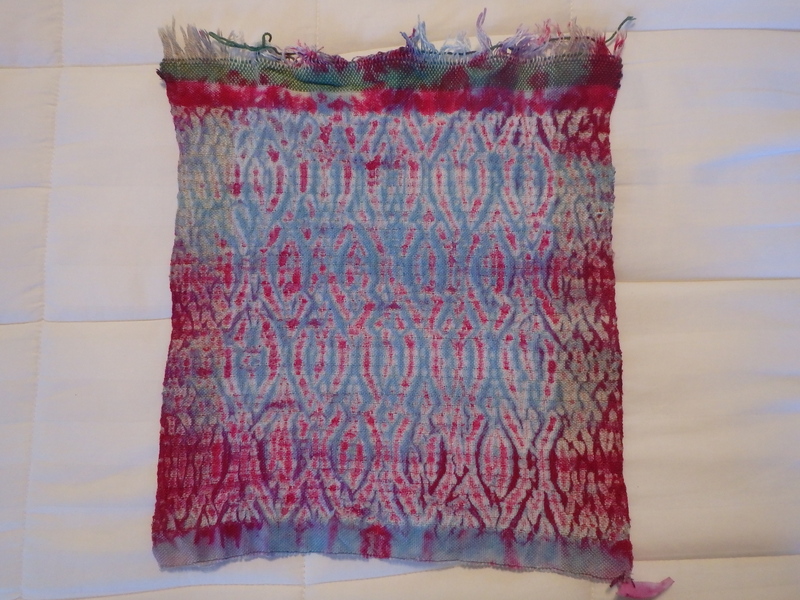 Next we dyed the fabric, let it dry, then pulled out the gathering thick threads so the fabric spread back out. 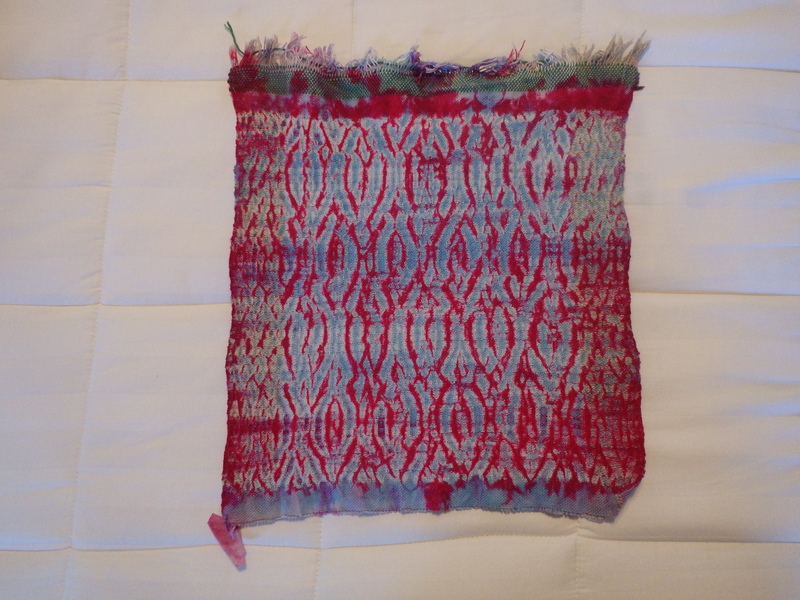 The fabric had taken the dye in some places but not others, because it had been gathered. I had fun experimenting that weekend. 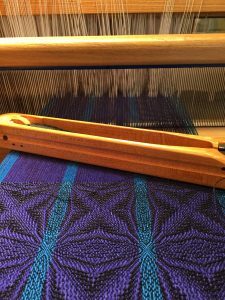 When I came home, I wove some more using that technique and even tried it with a warp I had set up on the loom in an overshot pattern. Since I’m not an experienced dyer, I just let them sit around until I got the gumption to attempt the dying portion. 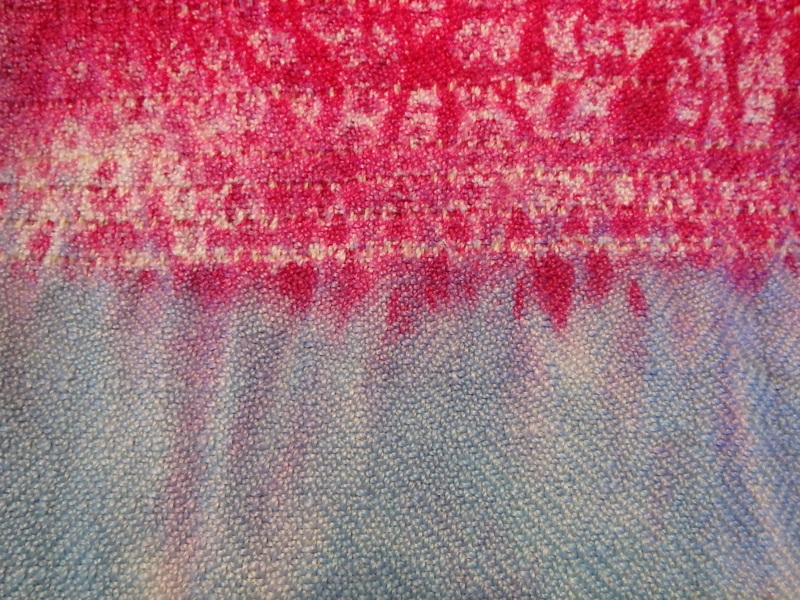 Last month I finally took a deep breath, got out the dyepot and went to work. The colors aren’t expert, but the effect is fun. 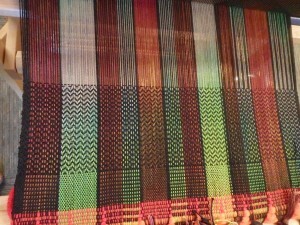 The green thick threads will be gathered up when the cloth is off the loom. You can see how the cloth has been gathered by pulling the thick threads tight. 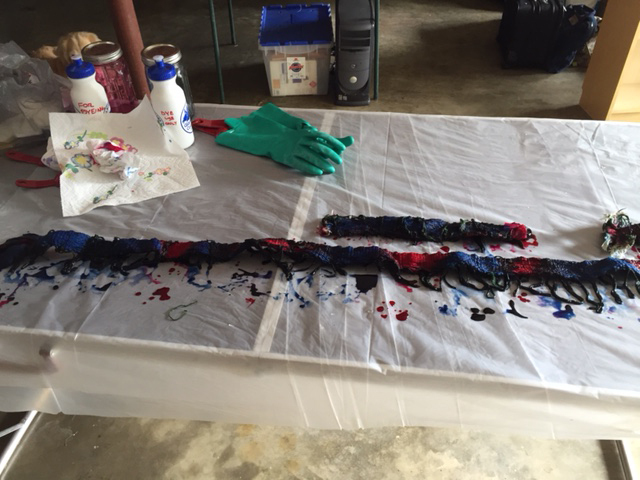 Here’s the dye set up. 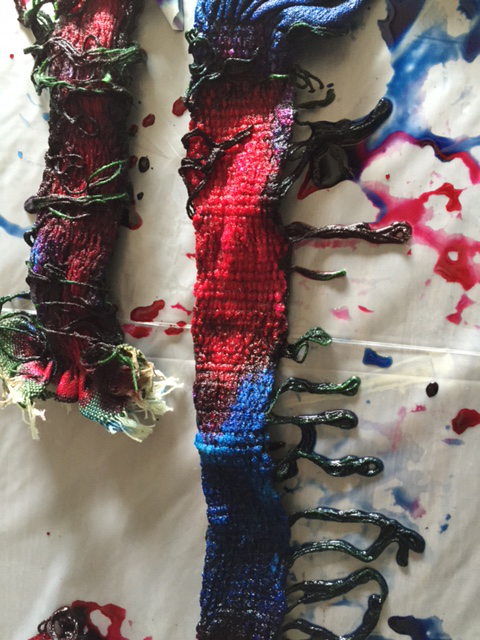 I used discarded water bottles to squeeze red onto some areas and blue onto others. 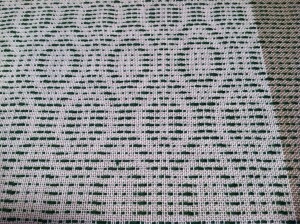 This pattern was an overshot pattern. Here’s side A. This is side B of the overshot pattern. Here’s a longer piece. 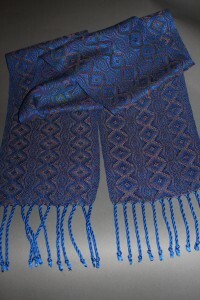 The thin yarn wove one twill pattern and the thick yarn wove another twill pattern. Here’s a close up of the longer piece. 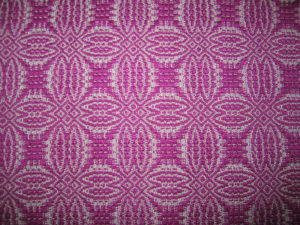 In this close up you can see the background twill pattern in thin thread. I learned a few things when I dyed on my own. First, I just need to do it more. Second, the horizontal stripes in the big piece were kind of distracting. 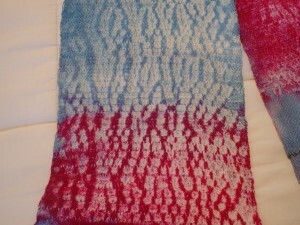 Third, the most successful dying was when I dyed one side of a piece in color A and the other side in color B. That effect gave more interesting results. I guess I have another area to explore now. 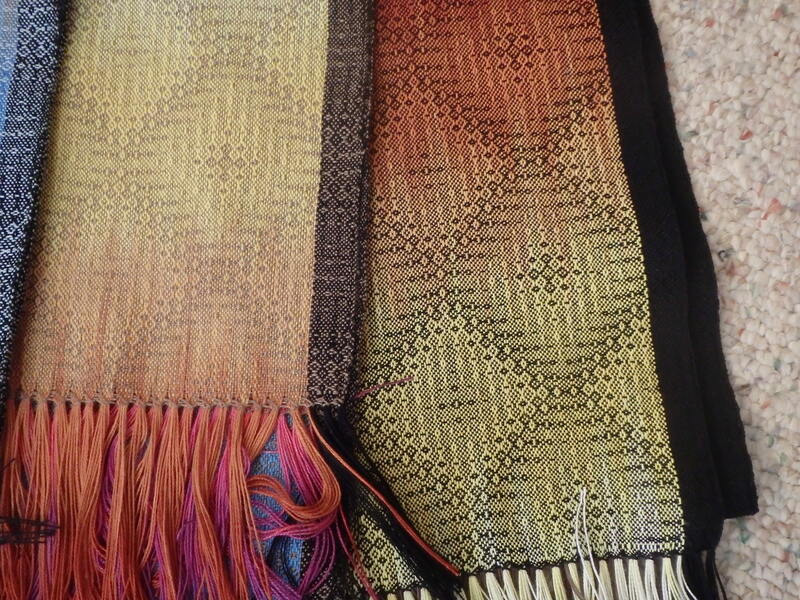 There’s always something new to learn in weaving. How much fun is that? After the Blazing Shuttles workshop, I purchased yarn from Kathrin Weber. 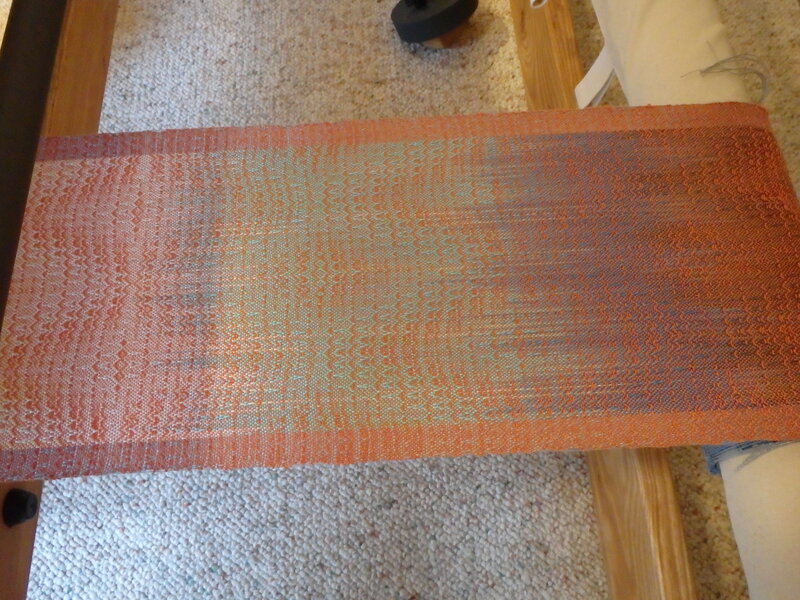 It came in the form of a lovely painted warp called Summer Daze. Warp is the yarn I put on the loom to set it up for weaving. 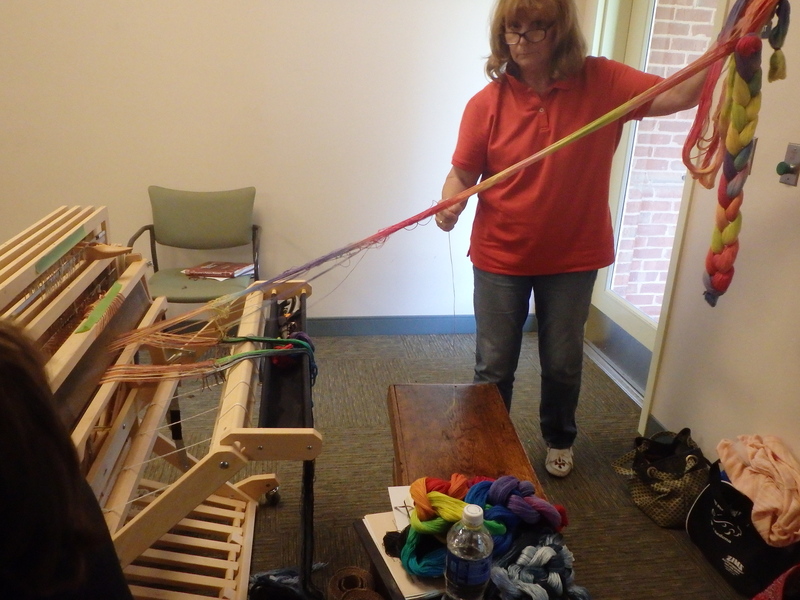 Setting up the loom is the most technically tricky part of weaving and can take hours. 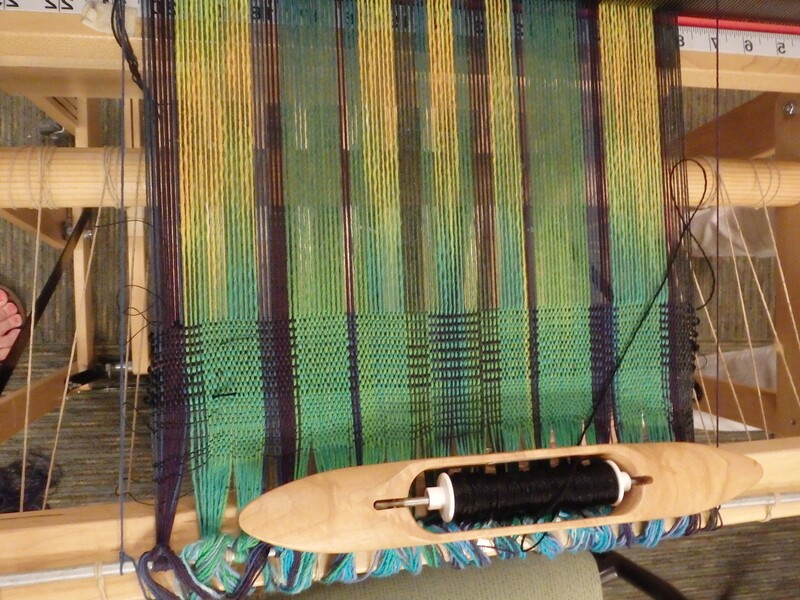 The warp consisted of 400 threads and I used half of them at a time. 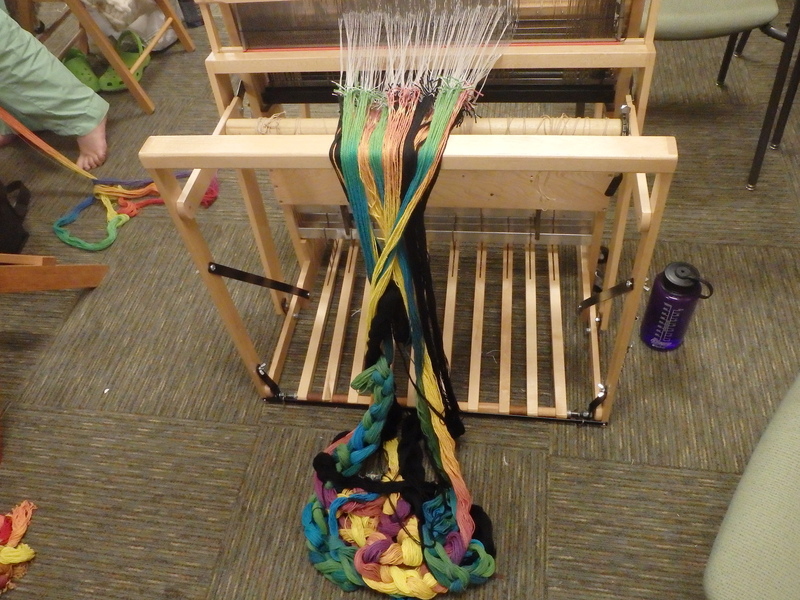 First I set up the loom with 200 threads of Kathrin’s hand-dyed warp in the middle and about an inch of commercially dyed black on the outsides. 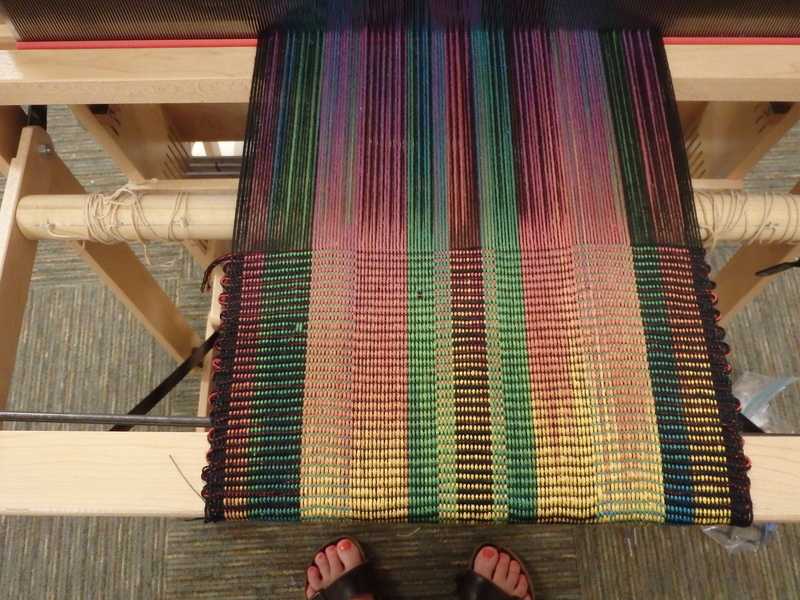 After weaving 4 scarves I had gotten to the end of the first set of warp threads. I put on the last 200 warp threads and put an inch of bluish gray threads on the outside where the black had been before. 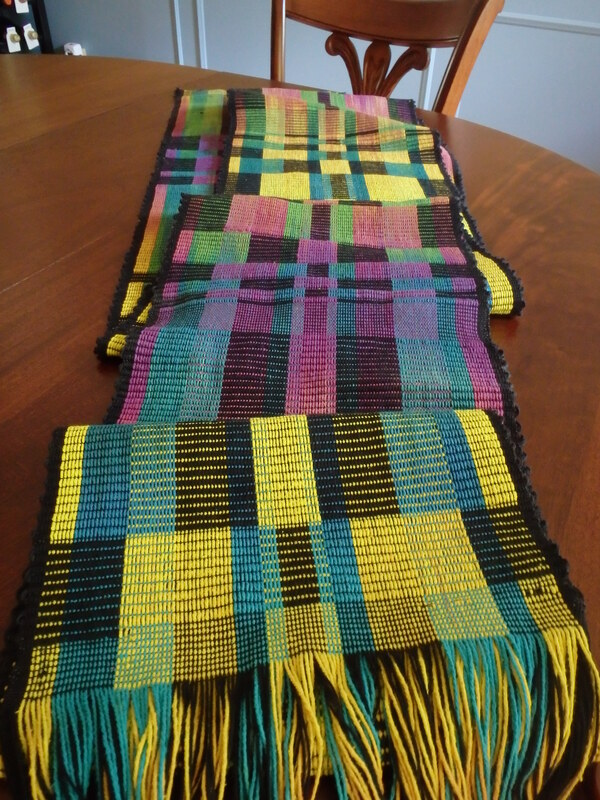 I’m almost finished weaving off the second set of scarves. 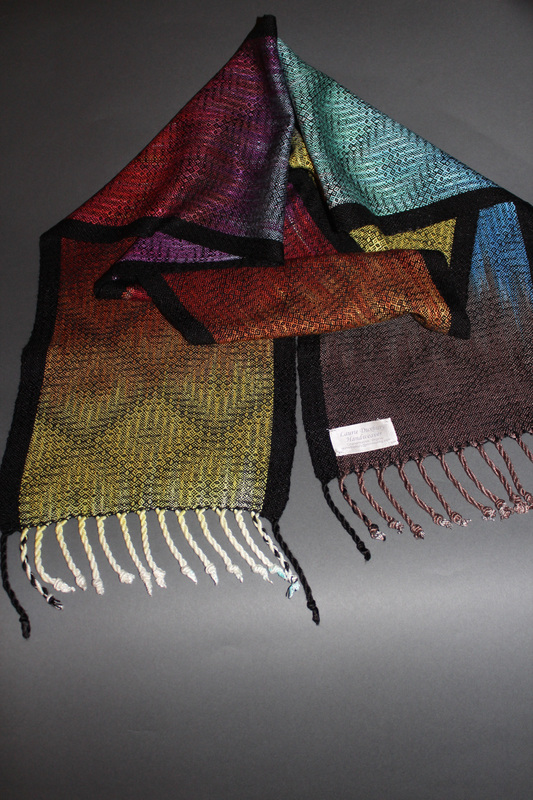 Scarves with silver, taupe and black weft. 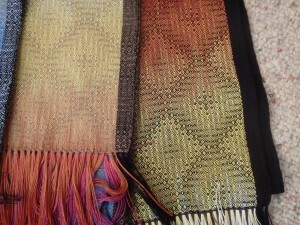 Taupe weft on the left and black on the right. Each scarf is different from the rest. 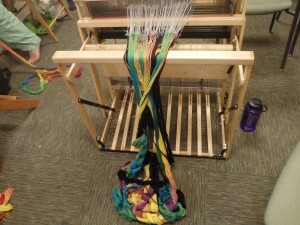 I use different colors of weft, the thread that goes back and forth between the warp threads. 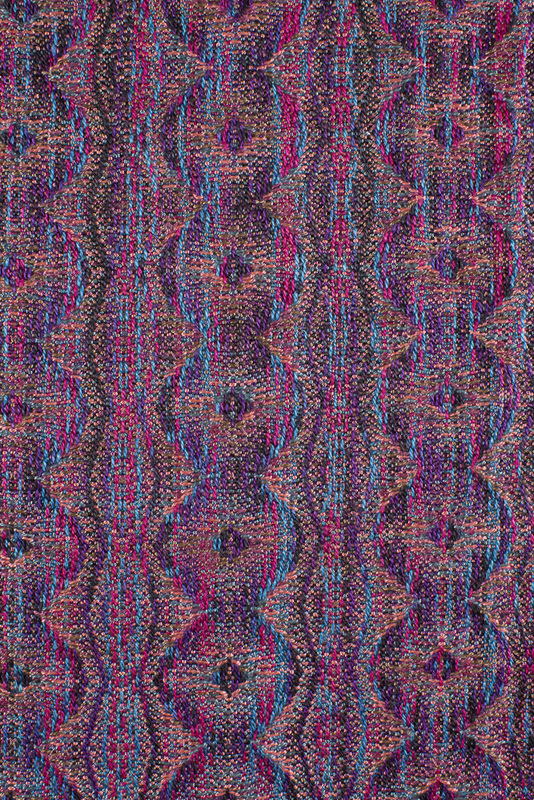 I also wove some slightly different patterns. It is really fun to see how the colors combine. 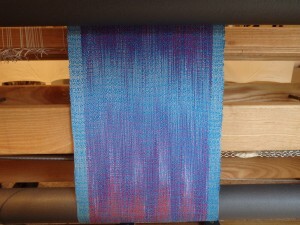 Still on the loom, but it looks luscious. 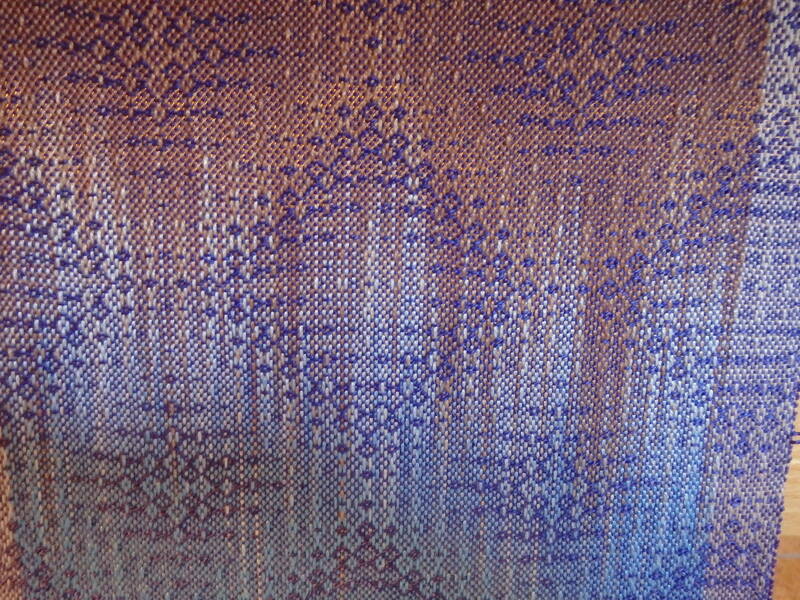 Purple weft scarf still on the loom. When I’m finished with them all, I’ll twist the fringe, wash, dry and iron them. 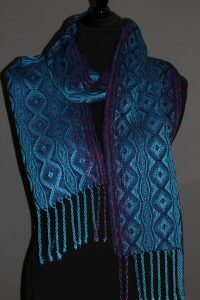 At each step along the way they relax a bit and should give lovely, soft, shiny scarves. 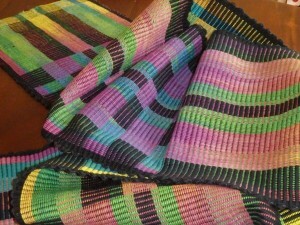 The fabric from the Blazing Shuttles workshop is off the loom and in my hands. It took longer than I had planned, but that’s because it’s summer and I love to play outside. 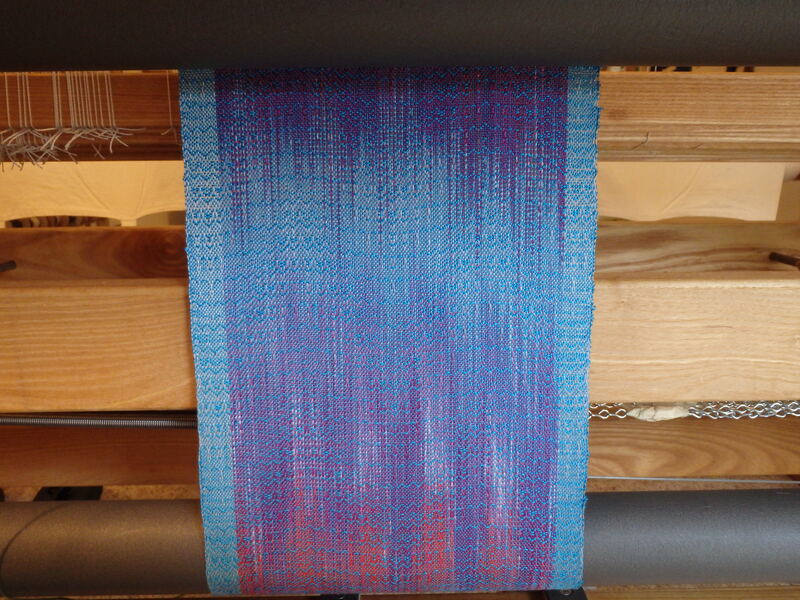 When humidity or showers forced me back to the studio, the sunny colors of the warp on my loom greeted me. What fun it was to weave the rep weave piece. 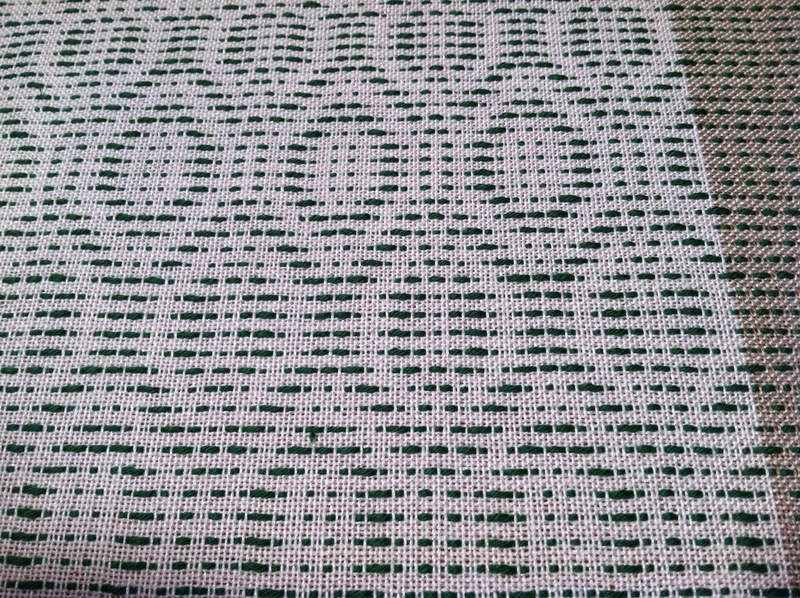 I used Kathrin’s workshop suggestion number 3 and threaded blocks randomly throughout the warp. I wove blocks randomly, too. That’s different for me. I feel much more in control when I have my piece planned out ahead of time. This was fun. Here’s a bit of technical information for you weavers. 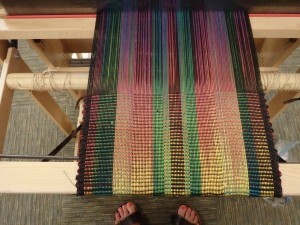 I combined two hand-dyed 8/2 warps with a black 8/2 warp and set the warp at 24 ends per inch. The warp was a bit sticky at times, but I learned to make accommodations by clearing the shed with the reed. 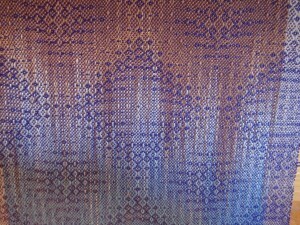 Next in line is to finish a 5-scarf warp I have on the big loom. When done I’ll dress the loom with a Blazing Shuttles 6/2 tencel warp and weave some scarves with that. In the meantime I’ll figure out what to do with the workshop fabric. I’m thinking bags and maybe a runner or two. 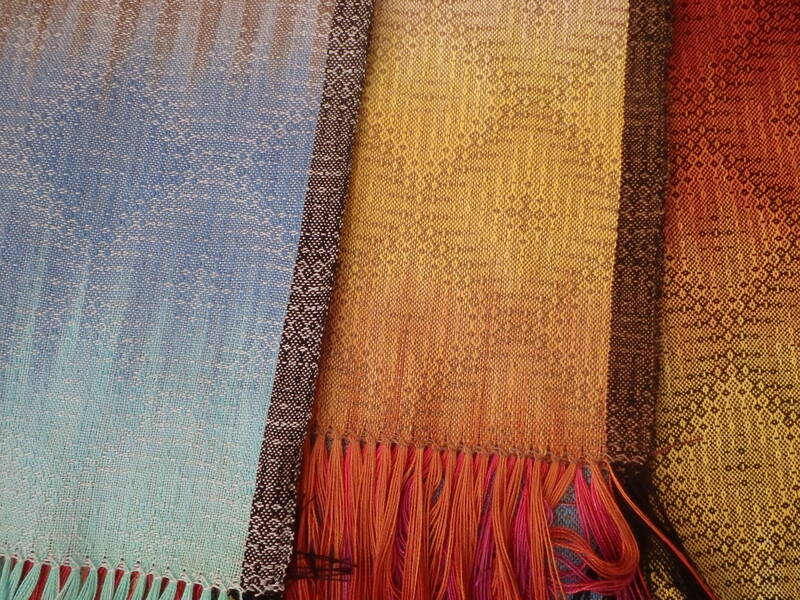 Weaving these warps is good summertime play. I can come into the studio from working in the garden to a whole new palette of colors. 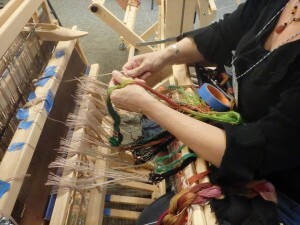 We weavers spend a lot of time alone in our studios. This weekend, twelve of us got together to learn from Kathrin Weber of Blazing Shuttles. 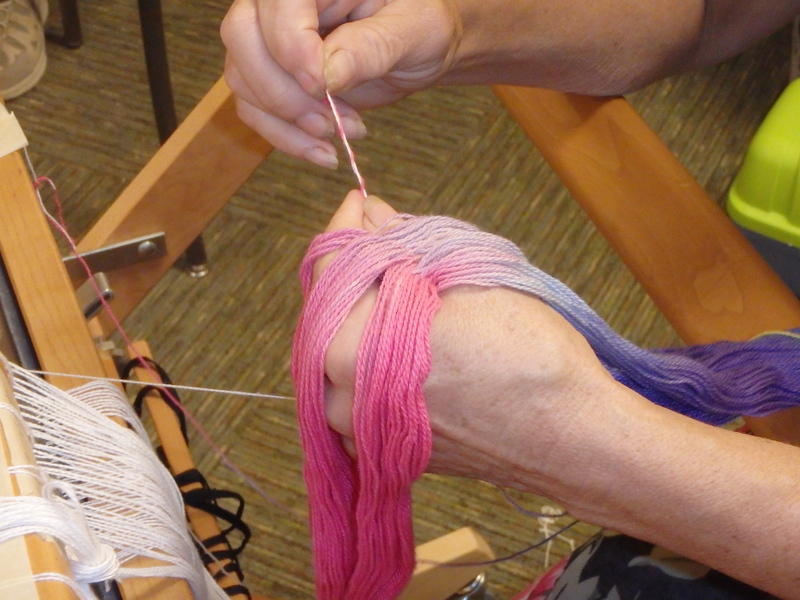 She brought her beautiful hand-dyed warps and taught us how to use them to their full advantage. We each brought a loom already set up with a short warp. All we needed to do was tie the new warp on to the old, crank the knots through the reed and heddles, then wind the new warp around the back beam. That sounds fast and easy, but it took us all weekend. 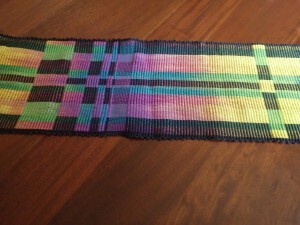 First, on Friday night, we had to choose from all the colorful warps Kathrin had brought. Fortunately we’re a friendly bunch and no fights broke out. 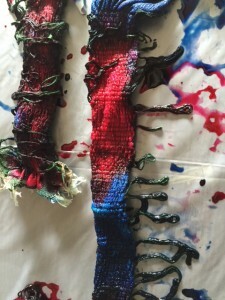 We each ended with colors we loved as she worked with us individually to find a couple of dyed warps that would go well together. Saturday morning we arrived ready to come up with a design using stripes of our 2 or 3 different sets of warp threads. This was fun–seeing how everyone came up with a different design. Some of us counted threads meticulously. Some of us flew by the seat of our pants. Some measured and sketched and did math. We all anticipated how our color combinations would work. 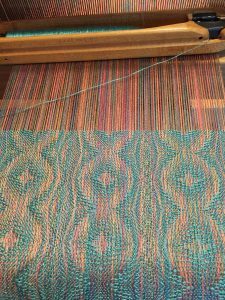 By mid-morning we had begun to tie our new warp threads to the “dummy” warp threads we had set up on our loom before the workshop. Who knew tying 200-300 knots would be enjoyable? We chatted amiably as the day progressed. Most of the hard thinking was over and our fingers were moving busily. By the time we were done for the day we had most of our new warp tied to the old. We arrived early on Sunday to begin the process of pulling the knots through the reed and the heddles. 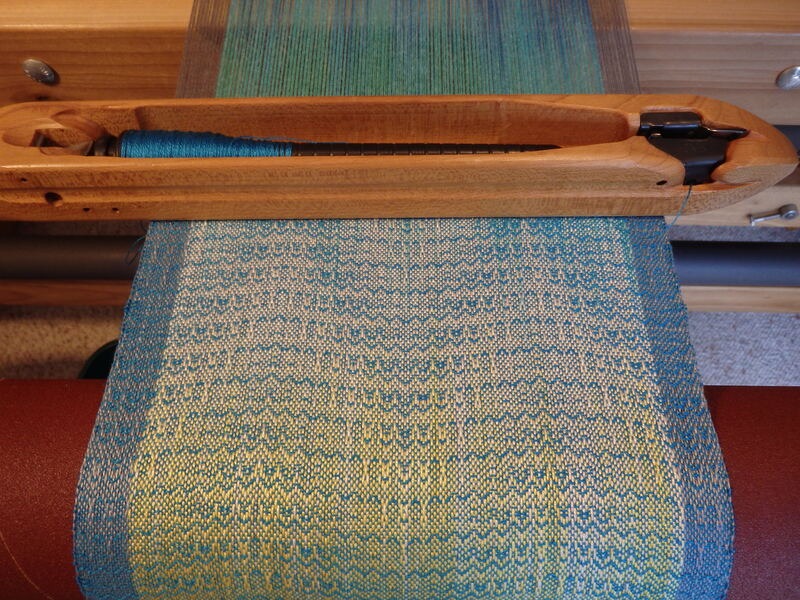 We had 4 yards of warp on the floor which meant lots of possibility for tangling. 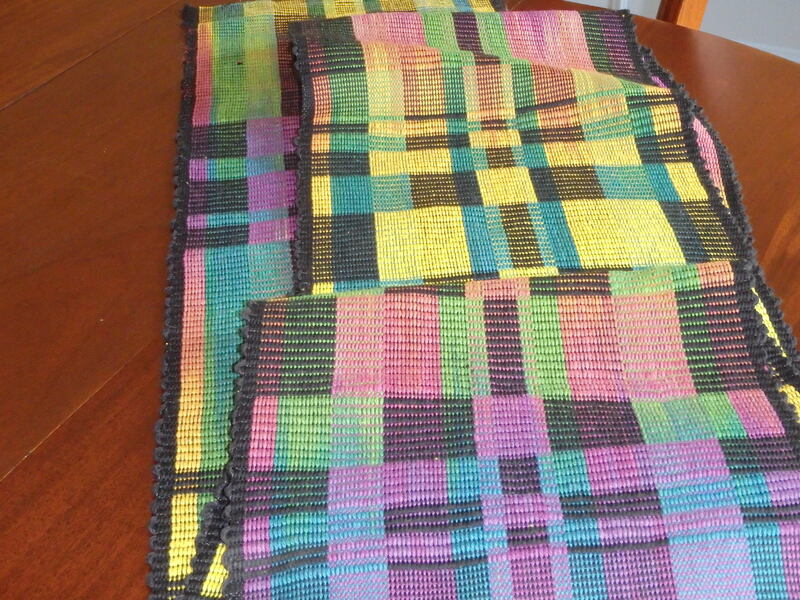 One of the advantages of weaving alone is that nobody hears you swearing when things don’t go well. We quickly learned each other’s favorite curse words. They ranged from polite to sailor-mouth. We tugged and sorted and strummed and beamed. But we DIDN’T COMB our tangled warps since Kathrin strictly forbade it. Instead, she taught us her methods for making our warps magically untangle. Since she is a great teacher, all did well and there were no tears. I’m ready to pull the knots through the reed. My warp is spread over the back beam. Dee Dee starts to weave. By the end of the day we had beamed on, tied our new warps to the front of our looms, and woven enough to get us started.Throughout the weekend Kathrin kept us amused by her jokes, motivated by her vision, inspired by her passion. I’m eager to finish the warp I brought home with me and to explore using color boldly in my future projects. 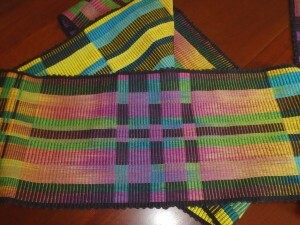 My weaving is settling in. It’s time to take it home and make fabric. I love playing with color. It’s like painting but I use different colored threads instead of paints. My shelves are full of cones of 8/2 Tencel from WEBS. 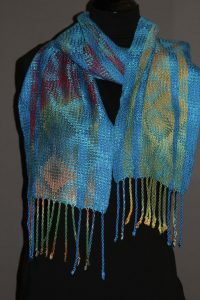 The yarns are my paint and the loom is my palette. Usually I know what the results will be when I grab a couple of colors to put together. Sometimes, I’m surprised though. Two colors that I thought would blend perfectly may look awful together. Two colors I don’t like at all may look lovely as they blend with each other. 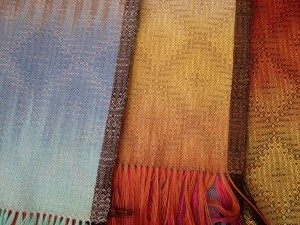 That is part of the fun, the play, of weaving. When I paint a sunset, I blend colors from orange through red to purple and then blue. I can do the same with my threads. 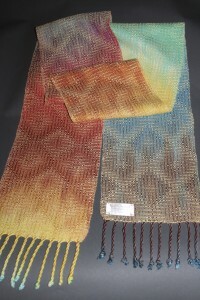 In the scarf below I blended a brightly dyed, variegated warp–the vertical threads, with a muted variegated weft–the horizontal threads. Then I chose a to weave a pattern that sometimes showed more of the warp and sometimes more of the weft. 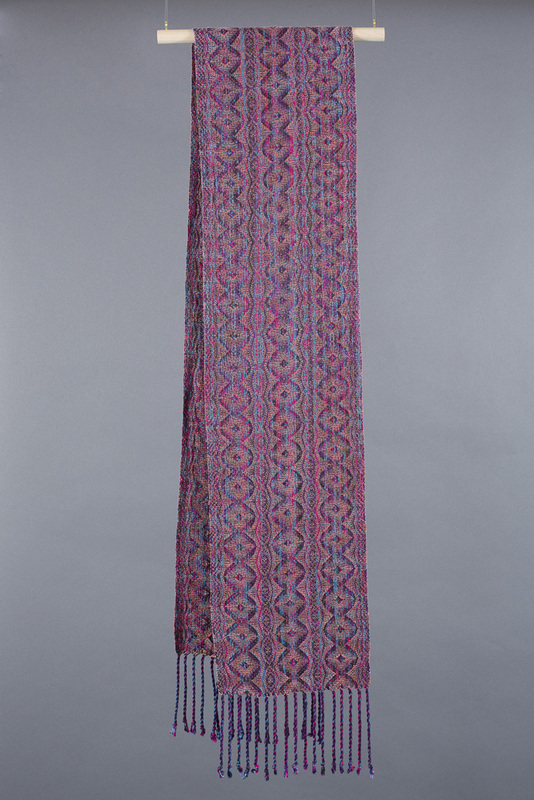 When you see the scarf from across the room it has subtle vertical stripes from the warp and a circular pattern made by the weaving. When you come closer you can see more details of the pattern. 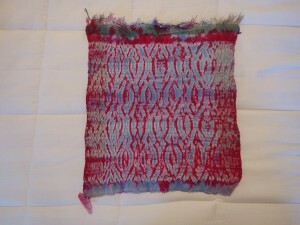 Looking more closely you can begin to see areas of bright threads and areas of muted threads. When you get right up close you begin to see individual threads. Sometime the the muted threads go over 3 or 4 brightly colored threads and sometimes the just go over one thread. So painters aren’t the only ones that get to play around with color. Weavers do too, and boy is it fun.